Looking for tax-related documents for an upcoming exhibit today, I found death instead (or perhaps it found me? ), in a small, but heart-breaking moment from the past. On October 29, 1870, Bradford Adams died of typhoid fever aged 15 years, 11 months and 3 days. Father and Mother are George T. and Lydia T. Adams; Horatio is our old friend the capitalist. 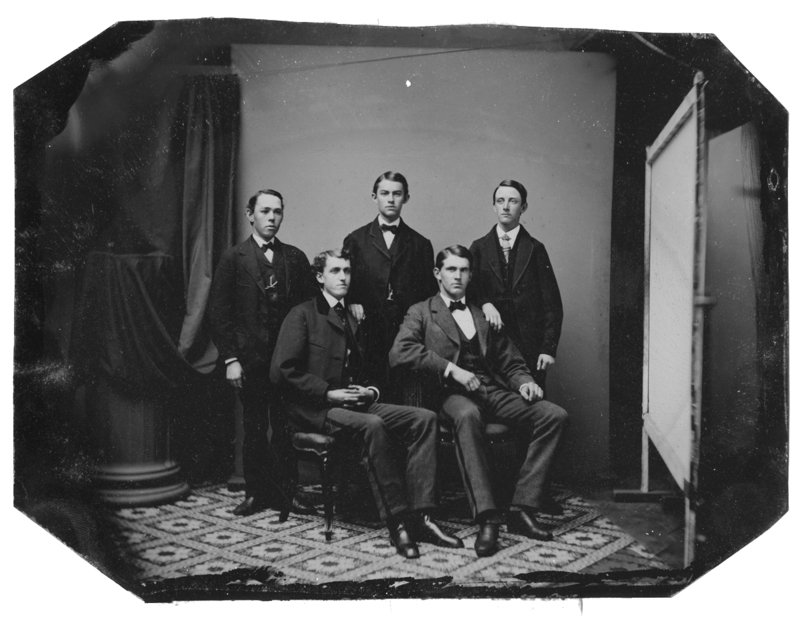 In this group portrait, Bradford sits at right and his older brother Wendell — more formally George Wendell — stands at center. Sadly, Wendell had died just weeks before Bradford of the same disease. A third Kingston teenager, 17 year old Clara Winsor, had also died of typhoid fever that fall, but beyond these deaths, Kingston was spared an epidemic. Through the 1860s and 1870s, outbreaks of typhoid fever struck around the world, particularly in densely populated and rapidly industrializing areas. By 1884, the bacteria that caused the disease was identified and over the next two decades, effective vaccines were developed. But in the spring of 1871, George T. Adams added a new stone to the family plot in Evergreen Cemetery, most likely for his two boys. 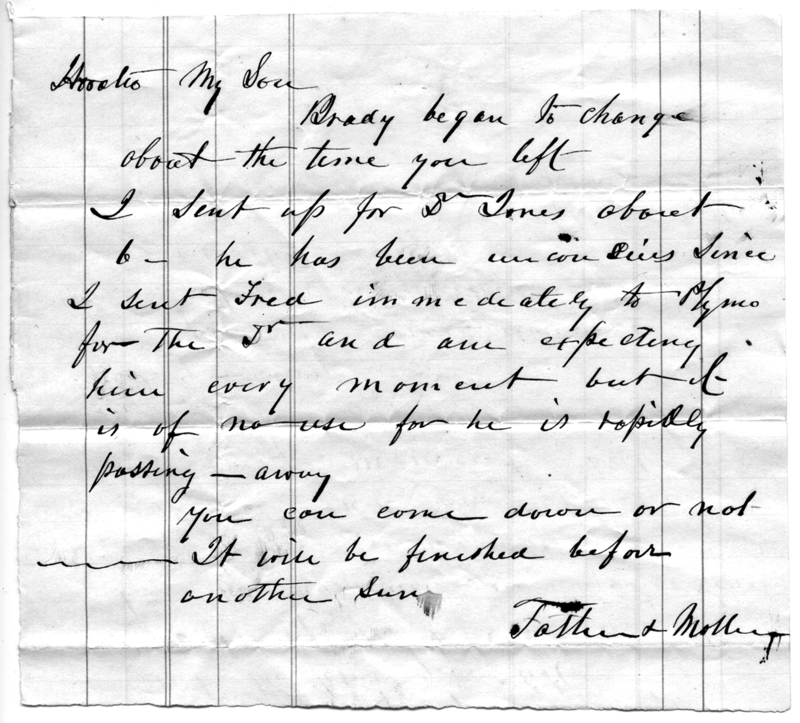 Sources: MC-21 Hathaway Collection; MC-23 Helen Adams Collection; Town Clerk’s Report, 1870; Wikipedia article on typhoid. Last week’s look at the capitalist Horatio Adams leads to this week’s pique. 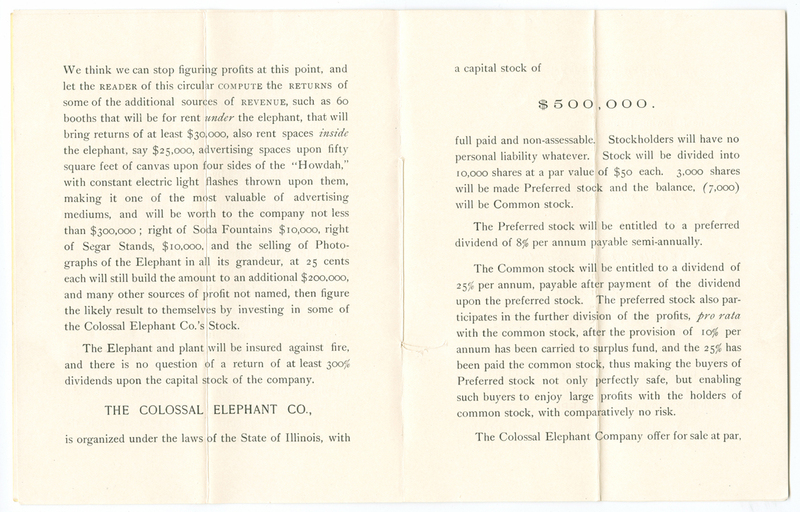 Among the many stockbroker’s receipts, enticements to buy land in Nebraska, an 8% Gold Bond for the Death Valley – Arcalvado Consolidated Mine Company, and stock in the Association Salt Company is a beautiful little booklet. 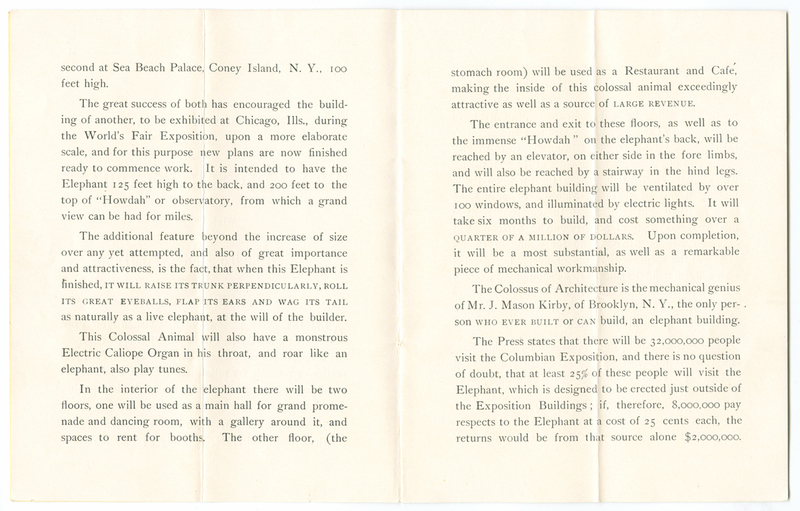 Better yet, “beyond the increase in size over any yet attempted, and also of great importance and attractiveness, is the fact that when this Elephant is finished, IT WILL RAISE ITS TRUNK PERPENDICULARLY, ROLL ITS GREAT EYEBALLS, FLAP ITS EARS AND WAG ITS TAIL as naturally as a live elephant.” A “monstrous Electric Calliope Organ in his throat” would add sound. 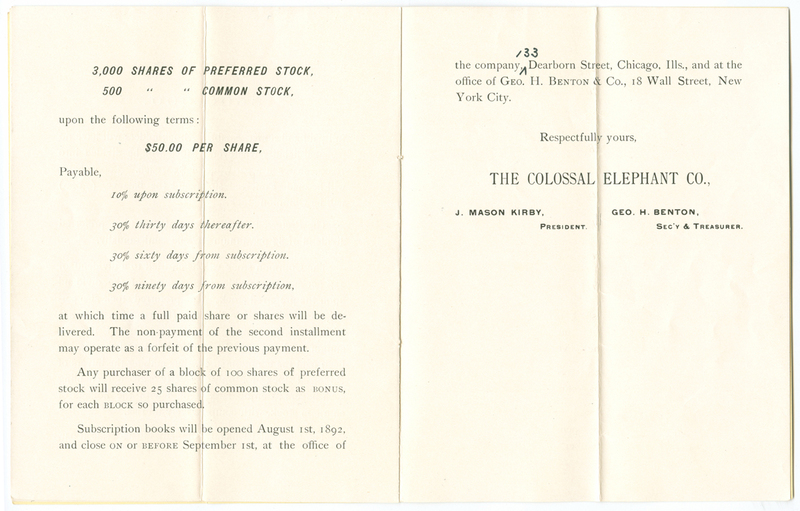 After some discussion of the profit potential in soda fountains and “segar” stands, the prospectus notes that “the Elephant and plant will be insured against fire,” a good plan as the Coney Island Colossus would be destroyed by fire just a few years later. As tempting an opportunity as the eye-rolling, ear-flapping Colossal Elephant represented, Horatio was not swayed. 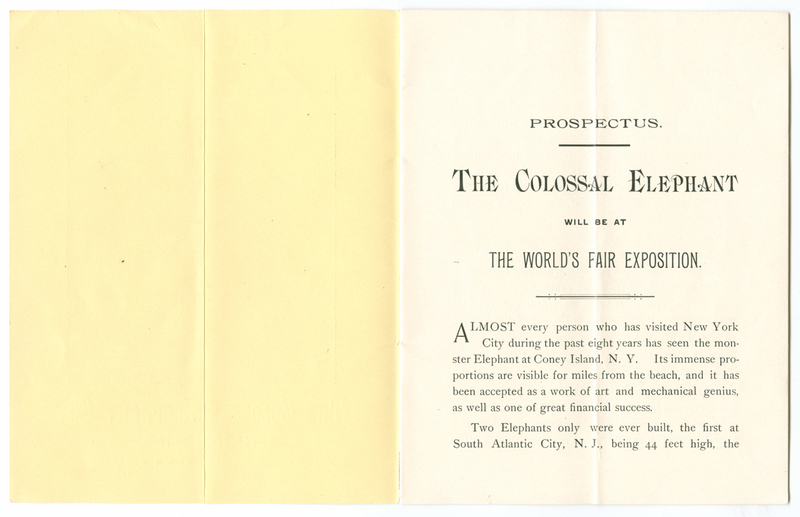 And it seems he was not alone in turning down the investment: searching through books and photographs and postcards related to the Fair yields not a single clue that the Colossal Elephant was ever built. Here is the Capitalist at his desk. And the tools the capitalist used to manage his labors? The book atop the glass case reads “Neapolitan Ice Cream” probably a business directory of some sort, and inside the case, “A Fragment of Plymouth Rock” with a certificate attesting to its authenticity. There’s a telephone and an electric lamp, a fountain pen and a blotter. There are law books piled and documents filed in pigeon holes. There’s also a picture on Horatio’s desk of someone sitting at a desk which looks at lot like this one. 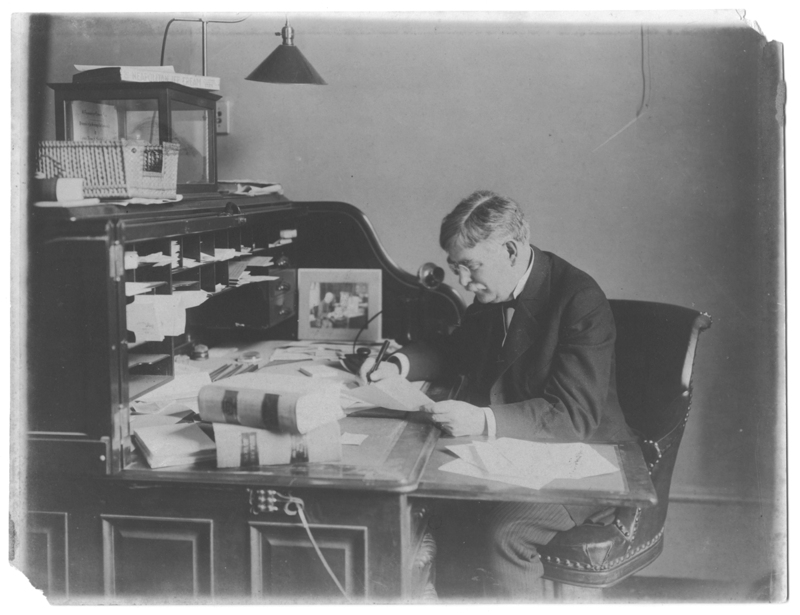 The second photo seems earlier: there’s no phone or electric lamp, though the desk looks the same. 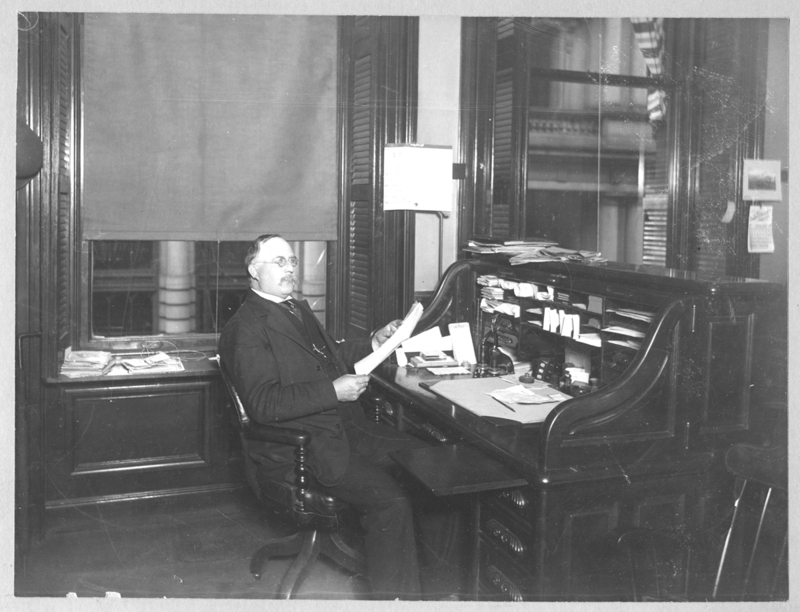 Horatio Adams, according to his obituary, worked in the Boston Office of the Atlantic and Pacific Railroad, then moved to New York with the company for a year. He returned to Boston to work for Frank Hay, “an expert accountant,” and was employed by the firm of John A. Burnham and Sons for many years. 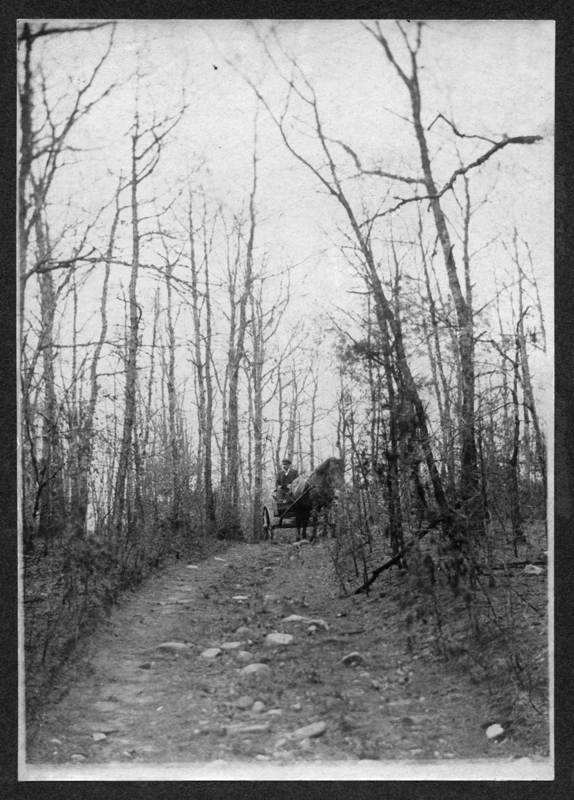 His connection with the Old Colony Railroad and its various 19th century incarnations began early. He was born on the day the first train passed through Kingston, November 8, 1845 and except for his year in New York, took the train to Boston every day until his death on April 7, 1911. His obituary noted that he was the oldest commuter in and out of Boston. Horatio is also closely connected to the Kingston Library. His portrait hangs in the Local History Room and photos of him appear in numerous collections. 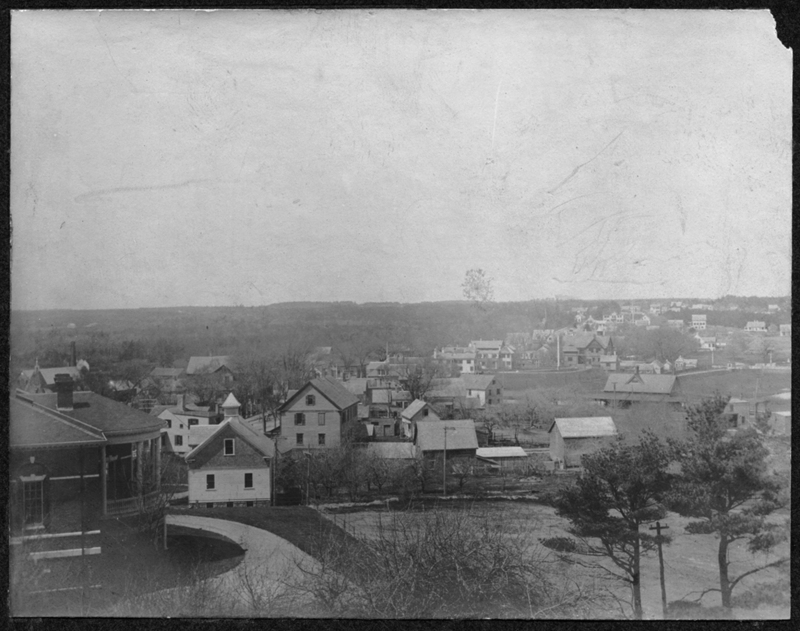 He and his mother Lydia (Mrs. George T.) Adams donated land upon which the Town built KPL’s predecessor, the Frederic C. Adams Library, funded by the will of Horatio’s uncle. Horatio served as a Trustee for Adams Library for some time. Returning to Horatio’s capitalist ways, stock certificates and investment prospectuses in LHR collections show his interest in all kinds of ventures, including the development of Fort Payne, Alabama and office buildings in the Mid-west. 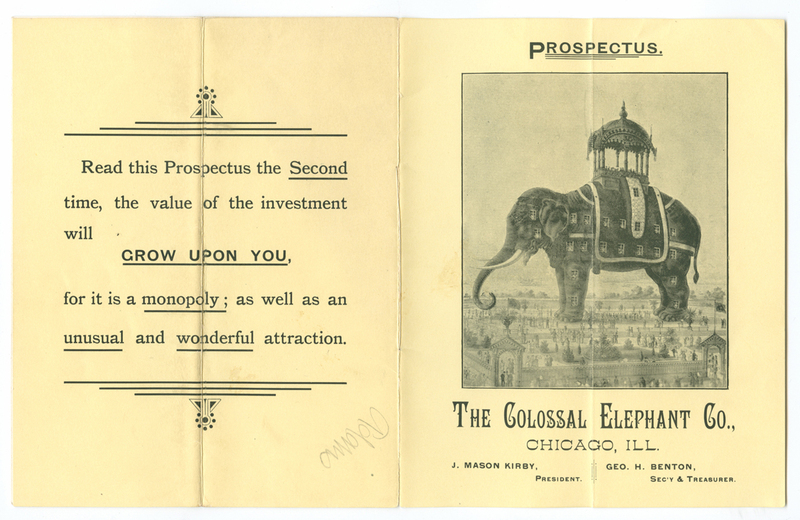 Perhaps the most interesting is the booklet prospectus for the Colossal Elephant. Stay tuned for that.